Here at the TSM Modeling Agency, we know how important it is to make the most of your exhibitions and trade show appearances. Our models have years of experience in the promotional industry. Hire bikini models, booth babes and promo models for your Honolulu, Hawaii show. Our Hawaii modeling agency is ready to match your company and your goals for your next event to the right people from our team. These bikini models we will provide you with are attractive, personable and friendly; the ideal assets for attracting attendees as crowd gatherers and hostesses to your booth, talking to them about products and presenting a great brand image for your company. Contact the TSM Modeling Agency and get staffing solutions for your Honolulu, Hawaii show. Areyou in search of Hawaii modeling jobs? If you are a bright and outgoing person who is comfortable on the trade show floor or other sales driven environment, then we want to hear from you. Whether you have been a car show model, brand ambassador, worked at festivals or conferences or other promotional events then, you could be a good fit for our company. Enjoy varied work in a fast paced professional environment. Represent companies from all over the country at events and shows. Join their sales teams as brand ambassadors to qualify leads and generate sales. With the TSM Agency, you have a chance to shine as a professional promotional model with a company that appreciates and rewards talent. To find out more about Hawaii modeling jobs contact the TSM Modeling Agency! Honolulu is the capital and most populated city of Hawaii located on the island of Oahu. Honolulu has been put into the world’s attention in many ways including historical recognition following the Japanese attack on Pearl Harbor on December 7, 1941 and the birthplace of Barack Obama, 44th President of the United States. Honolulu is one of the most popular tourist destinations in the world due to its isolated Pacific location, perfect weather and extremely hospitable Hawaiian culture. Honolulu has several unique neighborhoods including the 12-block area Arts District in downtown/Chinatown, Kaka’ako a light-industrial district, and Ala Moana, mainly a shopping center. Honolulu acts as a natural gateway to the islands’ huge tourism industry, as well as allowing the city to be a major trading and business hub in the Pacific. Honolulu also has a large American military presence due to its valuable and strategic location. Several companies are based in Honolulu such as Alexander & Baldwin, First Hawaiian Bank, Hawaiian Electric Industries, and many more. Honolulu International Aiport is located on a man-made island just off the Hawaiian shore, and is easily accessible to the city of Honolulu. Choosing which attractions to see in Honolulu is no easy task, however – Honolulu businesses are experts at tourism. There are tourists year round in Hawaii, flying into Honolulu. Hawaiian culture is rich in history, and has much to share. Honolulu is also a beautiful metropolitan city with all the amenities. The islands themselves could take up an entire trip to explore. Places to visit include Lolani Palace, the Waikiki Aquarium, and Honolulu Zoo. 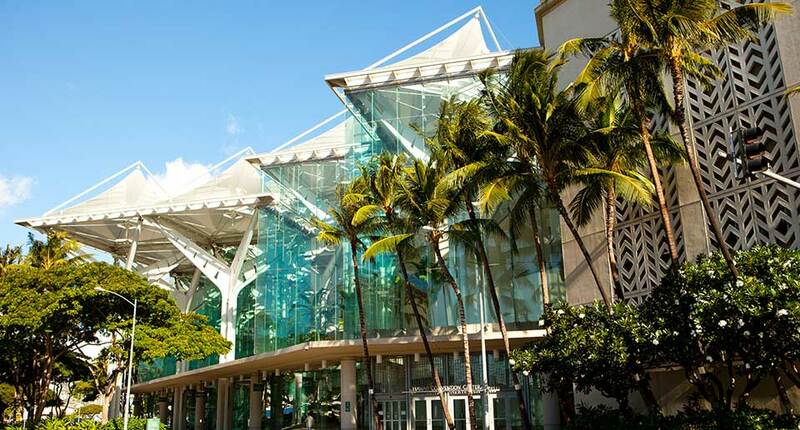 The most famous convention center in Honolulu Hawaii is the Hawaii Convention Center hosting events such as the annual First Hawaiian International Auto Show and the Miss Hawaii competition. BECOME A HONOLULU, HAWAII MODEL - SIGN UP!